Take each hard boiled eggs and using a sharp knife, make 4 shallow slits along the length of the eggs. Make sure the slit are not to big. These slits ensure that the masala penetrates the eggs. Add 1 tablespoon oil and heat a lightly oiled griddle or frying pan over medium heat. Add a pinch of turmeric, chilli powder and salt and add the boiled eggs. Stir the eggs in the pan so that each egg is coated and lightly fry for about a minute. Remove the eggs from the pan and keep aside. Add the salt, turmeric, chilli powderc, cumin powder and tomatoes and cook for about 2-3 minutes. Add little bit of water ,if your masala gets to dry. Then add the chopped green onions and stir for 10 seconds. Add the eggs to this mixture, mix well and cook for about a minute. Garnish with chopped coriander and serve in a dish. Really good with Rotis ….. Enjoy ! 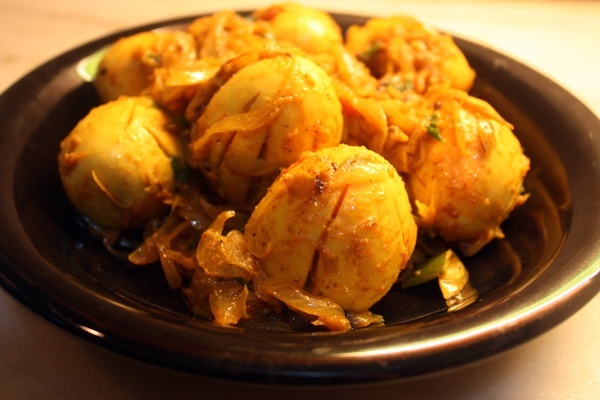 This entry was posted in Egg, Grand Ma's Recipes and tagged Eggs, Masala Eggs, Quick Food by Kamakshi. Bookmark the permalink.